State regulators exempt the popular attraction from a state ban on discharging wastewater in sensitive marine ecosystems. The Monterey Bay Aquarium sits on the protected Pacific Grove area of Monterey Bay. 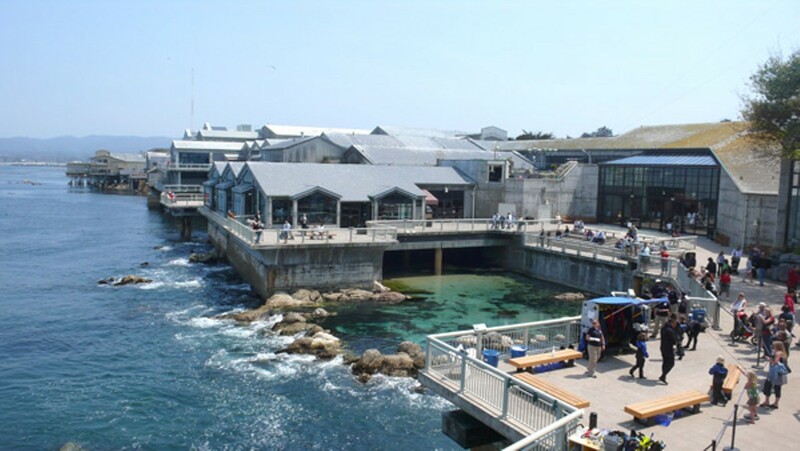 Although famous for conservation and its sustainable and environmentally friendly practices, the Monterey Bay Aquarium is also one of the largest wastewater dischargers in the protected Pacific Grove area of Monterey Bay. Last month, however, the State Water Resources Control Board exempted the aquarium from a state ban on dumping wastewater in a marine protected zone. The board decided the aquarium's conservation and public education benefits far outweigh any dangers posed by the millions of gallons of treated fish, bird, and mammal waste it dumps back into Monterey Bay. "The Monterey Bay Aquarium's beneficial uses include extensive public outreach and education on the marine environment, basic water quality research, and research to determine the needs and improve the quality of existence for marine life," said David Clegern, a spokesman for the water board. According to a report released by the board earlier this year, the aquarium takes in about 1,400 gallons of seawater a minute, 24 hours a day, every day of the year. It then discharges more than 2 million gallons a day. The system is open, meaning seawater is pumped in and discharged continually. The water board acknowledges that the discharge does contain waste, albeit "at very low levels." The only exceptions noted were copper in one seawater sample and chlorine in others. Copper is known to be harmful to marine organisms, damaging creatures' gills, livers, kidneys, and nervous systems. Chlorine can be lethal to many organisms, including salmon and oysters, at low levels. "None of the seawater samples exhibited toxicity effects," the report's authors wrote. However, storm water runoff from the aquarium contained waste and in some cases exceeded state standards. Aquarium officials say they do everything they can to minimize the harm the aquarium poses to marine life. For instance, the aquarium routes all seawater exposed to birds and mammals through ultraviolet sterilization before dumping it back in the bay. This process gets rid of bacteria and other microbes. Other discharged water, particularly water that has been in contact with exotic species, is run through ozone treatment in order to kill any larvae or eggs that could potentially reach the bay. And water treated with chemicals or pharmaceuticals is isolated and not released back into the bay. "Operating a large public aquarium requires substantial resources and a large staff, and we recognize that our environmental footprint is likewise substantial," aquarium officials wrote in a brochure about the aquarium's commitment to sustainable and environmentally friendly practices, called "Striving for Sustainability." "We are doing everything we can to minimize our footprint in the ocean," said Ken Peterson, an aquarium spokesman. "There's no doubt it's a challenge." The aquarium sits next to the Pacific Grove area, a state-designated Area of Special Biological Significance. Since 1983, as part of its Ocean Plan, the state has banned wastewater discharge into any of the 34 designated marine areas. In 2004, the water board notified the aquarium that it had to cease storm water and other discharges in the protected area or request an exception under the Ocean Plan. The aquarium sought an exception in 2006, and the state water board prepared a report on the request. In April of this year, a public meeting was held to consider the exception, and last month, it was finally approved. "By and large, this exception allows the aquarium to continue being a public aquarium exposing millions of people every year to marine life in the hopes that we can get them interested and concerned about ocean issues," Peterson said. "There is a value in that, and we are pleased it is recognized and valued by the State Water Resources Control Board."